Rattana Bundit University has been founded by Mr. Prachum Rattanapian, the former Education minister and Mrs. Vichittra Rattanapian with an aim to develop personnel with versatile knowledge. On December 18th, 1997, Rattana Bundit Administration College has been inaugurated. Upon the approval of the government’s public body in 2003, The College itself has been changed to “Rattana Bundit University.” We are proud to be one of Thailand’s leading universities to provide curriculums with international standard starting from the elementary to higher education. 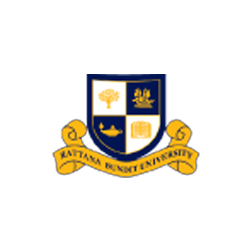 At Rattana Bundit University, we are committed to providing the educational opportunity for everyone regardless the social and financial status, creating and growing knowledge, contributing to society and producing graduates who are equipped with expertise, virtues and ethics. Our vision is to be the qualified educational institution with the capability to adapt to the globalized world as well as to possess the effective management system in order to accomplish all missions perfectly. We manage qualified educational system enabling students to be ethical, able to serve community and to live lives in harmony with the society. We ground knowledge with profound research and qualified innovations to be domestically and internationally accepted. We offer academic and occupational services to community and society and to provide knowledge to both public and private agencies. We preserve and value the culture and tradition of our country. We desire to encourage our students to be aware of the essence of these values. We have the governance management system which is crucially based on the Economics of Sustainable Development philosophy, the environmental consciousness and the guarantee of the education quality. Graduates adorned with knowledge, ethics and ability to live in the unison with the society. Research excellence to be internationally qualified as one of the best intensive-research university. Academic services with global standard. Integration of occupational knowledge and culture.